Twitter's 140-character microblog posts are increasingly used to access information and facilitate discussions among health care professionals and between patients with chronic conditions and their caregivers. Recently, efforts have emerged to investigate the content of health care-related posts on Twitter. This marks a new area for researchers to investigate and apply content analysis (CA). In current infodemiology, infoveillance and digital disease detection research initiatives, quantitative and qualitative Twitter data are often combined, and there are no clear guidelines for researchers to follow when collecting and evaluating Twitter-driven content. 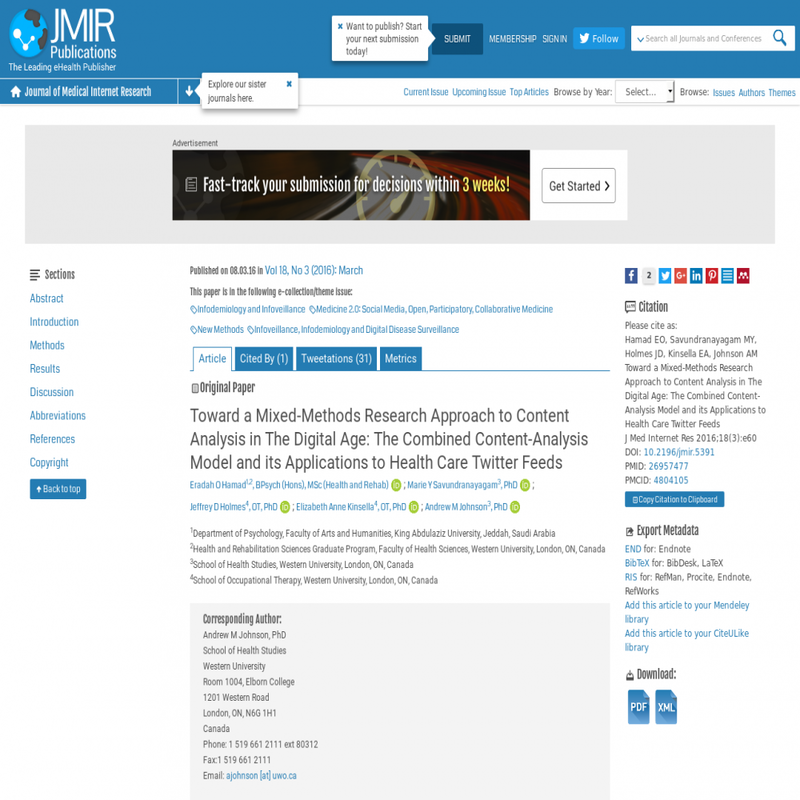 The aim of this study was to identify studies on health care and social media that used Twitter feeds as a primary data source and CA as an analysis technique. We evaluated the resulting 18 studies based on a narrative review of previous methodological studies and textbooks to determine the criteria and main features of quantitative and qualitative CA. We then used the key features of CA and mixed-methods research designs to propose the combined content-analysis (CCA) model as a solid research framework for designing, conducting, and evaluating investigations of Twitter-driven content. We conducted a PubMed search to collect studies published between 2010 and 2014 that used CA to analyze health care-related tweets. The PubMed search and reference list checks of selected papers identified 21 papers. We excluded 3 papers and further analyzed 18. Results suggest that the methods used in these studies were not purely quantitative or qualitative, and the mixed-methods design was not explicitly chosen for data collection and analysis. A solid research framework is needed for researchers who intend to analyze Twitter data through the use of CA. We propose the CCA model as a useful framework that provides a straightforward approach to guide Twitter-driven studies and that adds rigor to health care social media investigations. We provide suggestions for the use of the CCA model in elder care-related contexts.